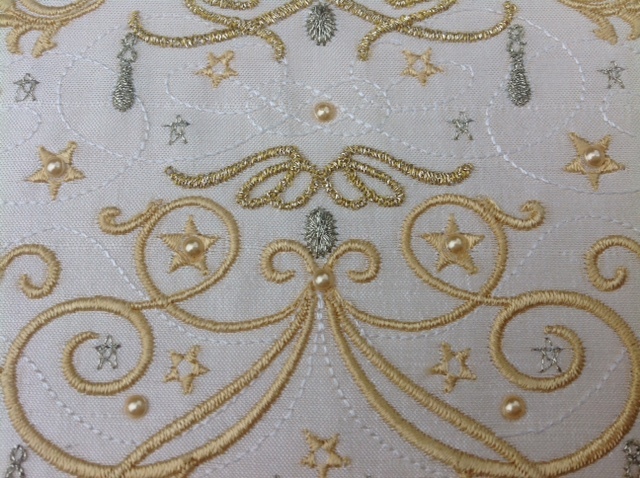 I stitched my final design this morning as promised to see how parts embroidered with metallic thread. 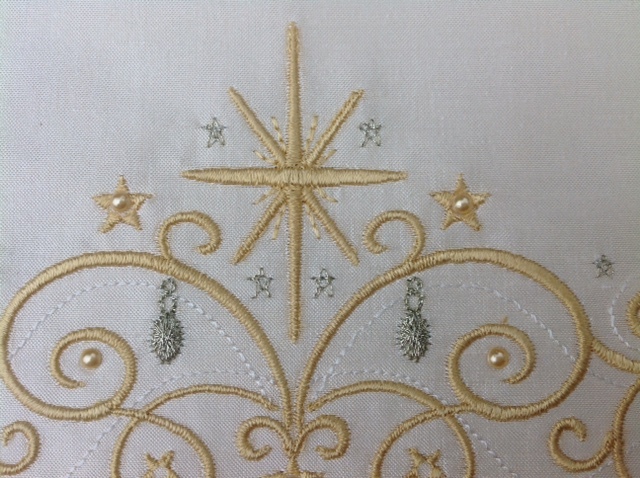 I used Madeira Gold 3 metallic thread for the centre scrolls and was not happy with the results having a few breaks. 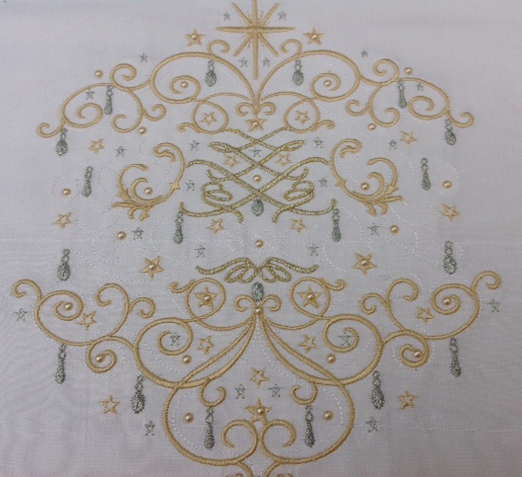 When I used Sulky 7003 metallic for the tiny baubles and stars I had no problems at all but I have always found my Diamond deluxe prefers Sulky threads and confess my Madeira one is probably a bit old. I embellished the design with tiny gold pearls which are currently my favourite. The overall effect was great and I apologise that my photography does not do the embroidery justice. I wanted to keep some simplicity to the design. Here is the overall design. While I had my hot fix tool out I decided to embellish the design I showed you in my previous Blog giving it 3 types of crystals: large (16ss) fern green and fuchsia ones and smaller(10ss) dark siam. Obviously there is a skill to attaching hot fix crystals and you have to be especially careful on darker fabric as there may be hints of glue around your crystals but persevere as it is just a matter of practise. My main tip for getting them to stick is to wait sufficiently for the glue to heat up. If you attempt to press them onto your embroidery too early they will remain in the heating tool and just leave a glue mark on the fabric. Not to worry though as a pin will remove them easily while you place the tool in the exact position you want the crystal to be in. Immediately upon removing the tool you can adjust the position slightly. It is always best to press them into place to be sure they are stuck fast. I count to 12 slowly before pressing them in place which works well for the 16ss and I wait for a count of 15 for larger ones and less for smaller ones. As well as having a few pins to help me dislodge crystals that get stuck I also use a little tray to hold all my crystals and have a fingered oven glove at hand to change the tips on the heating tool. 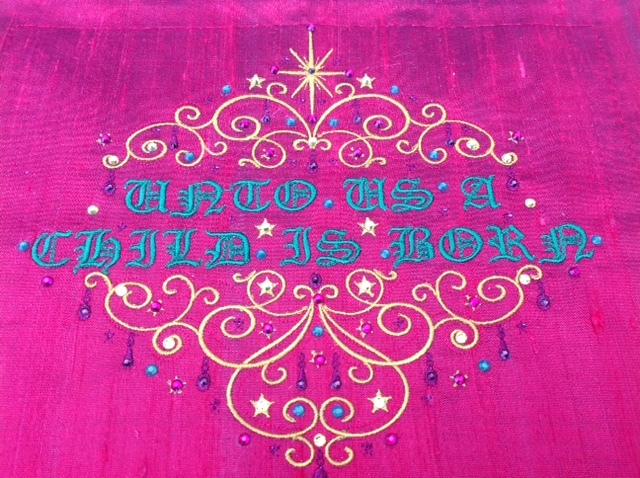 This entry was posted in Embroidery projects and tagged Christmas, Crystals, Embellishment, machine embroidery. Bookmark the permalink. I think it’s beautiful and can’t imagine how breathtaking it would be in person. I need to add a hot fix crystal tool and crystals to my Christmas list. Thank you Dana. They are fun to play with once you have the nack!